"Jeremy Varon here, the academic (new school) / activist (torture stuff) from New York. I enjoyed greatly the Berrigan remembrnaces, especially the poem, which itself feels very berrigan-esque in its cadence, morality, and imagery. "Jeremy, irreligious (of Sephardic Jewish coupled with a German Kantian background), resonates spiritually (as I do in certain ways) with Daniel Berrigan. Jeremy has long campaigned against torture at Guantanamo. And that certainly walks in the same footsteps as Dan Berrigan. A friend of the Berrigans, Father Stephen Kelly, who gave the service, had spent 6 years in jail for protest against nuclear war. He had been held in solitary confinement, an internationally recognized form of torture hideously practiced in the United States (in America, legislators are just beginning to open their eyes). He, too, had taken part in the first protest at Guantanamo with Witness against Torture in 2005. A mendicant priest who had few earthly possessions, lived to help others and save lives, Daniel Berrigan was in "the sacrament of the street." So were the 2,000 at the service. Paul Tillich, the Protestant radical theologian, was also a Marxian (and a leftwing Heideggerian). He was once 5th on Hitler's list of emigres to detain or kill (Bertolt Brecht was 12th), even though he became a "quietist" in the United States. In The Protestant Era, he speaks of the congealing of the Christian or Protestant principle in each epoch with the ruling class and evokes the need to fight for a world without social oppression. The IWW spoke, more colloquially, straightforwardly, of Jesus named "Jerusalem Slim" being a hobo just like them, bringing the spirit of resistance among them ("the kingdom of god is on earth, but we do not see it"). See here. That Jesus preached for, fights for the poor and oppressed, is pretty obvious to those who do not have a stake in some powerful and wealthy church. The love for the beauty of this world and the hope of life goes, into and beyond death, in Berrigan's words and in the feeling that Jeremy conveys about the gathering. As Tink Tinker, also a draft resister and organizer of resistance, and in this respect, an admirer of Daniel Berrigan and the Catonsville 9 , reminds me, Berrigan had a part in the chauvinist film "The Mission" in which the Jesuit, noble characters, give the Guarani in Paraguay "the book"; the indigenous play no role of their own, except to participate in communal farms and Jesuit resistance, and of course, their land and lives are taken. And this is Western Christianity historically, a conductor of chauvinism and genocide, even at its best. It is not clear to me why Berrigan, who prayed about and saw through so much and risked so much, acted out customary or reactionary Jesuitism in the movie, could not see through this (more on Tink's letter soon). Fidgety and a little bored in the crammed pews of the Church of St. Francis Xavier, my eight-year-old son waited with us for the service to begin. For distraction and readiness, he etched on his program, with his parents’ help: “Today we reflect on the life of Daniel Berrigan. He was a great priest, prophet, poet and peacemaker. He touched many lives with his actions and words. It is nice to be in such a beautiful church with so many people honoring a man they loved.” Simple and true, these words presaged a ceremony that edified and even transformed the two thousand or so people blessed to have been there. The death on April 30 of the 94-year-old Fr. 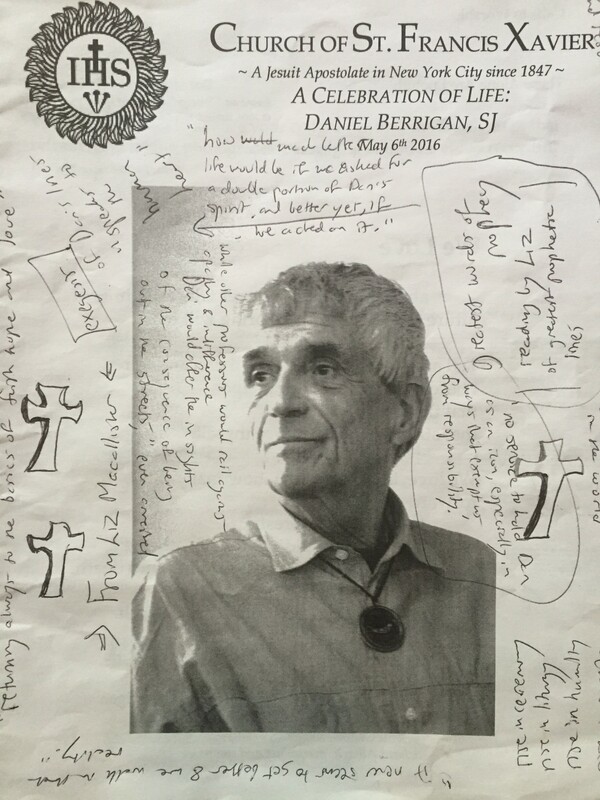 Dan Berrigan, S.J. at a Jesuit infirmary in New York City has been big news. Heartfelt obituaries have poured forth: from fellow priest and political troublemaker John Dear; from the rogue Washington Post columnist Coleman McCarthy, who for decades tried to explain radical pacifism to Beltway readers; from the New York Times, which ran an uncommonly long remembrance of Berrigan by the evening of his death; from Democracy Now, which devoted a full broadcast to his life and legacy; and from far-flung bloggers in the Catholic and peace and justice worlds. Most tributes have focused on Berrigan’s admixture of deep religiosity and militant opposition to war. His raid of a Catonsville, Maryland draft board office in 1968 and resulting trial was the signal instance of this union. Seemingly overnight, the deeds of the Catonsville Nine — so named to include the nine defendants, among them Daniel’s late brother Philip — have been turned by obituary writers from a semi-obscure episode in the history of peace movements into an epic act of American dissent, with Dan at its heroic center. The morning of the May 6th funeral, the Times added an endearing, page one profile of Berrigan as a mendicant priest in our midst. He died with virtually no possessions after a life of writing, protest, and service to others. 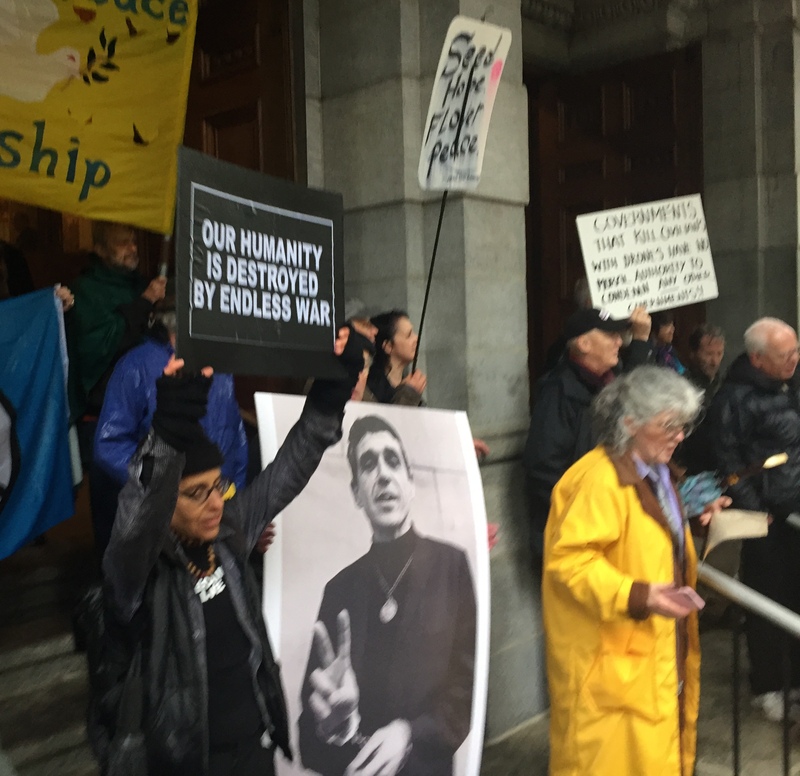 The purpose of the funeral, however, was neither simply to wrap Daniel Berrigan in holiness nor to explain the importance of his life. It was also to affirm and enact many of the things he believed in, while pondering the special meaning a life takes on in death. Deeply Catholic in ritual and pedagogy, it radiated a transcendent universalism. A portion of the overflow crowd at St. Xavier had made a grand entrance. 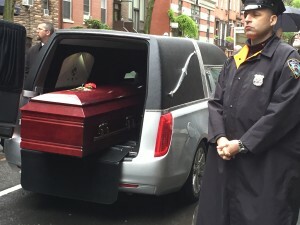 Before 8 am, 200 mourners stepped off from Maryhouse — the East Village headquarters of the Catholic Worker movement started in 1933 by Dorothy Day, a great mentor to Berrigan. The Rude Mechanical Orchestra, a motley, anarchic marching band, livened the soggy “Peace March” as it pushed through rain to the West Village church. [*] It was “the sacrament of the street,” explained Frida Berrigan, Dan’s beloved niece, to an NPR reporter. Just as Dan would have wanted it. A sing-a-long erupted at the church’s mouth. “We’re gonna lay down our swords and shields, down by the riverside. . . We’re gonna study war no more!” Torn from the biblical injunction to beat swords into plowshares, the song was the perfect anthem for the day. Dan, his brother, and a small circle of Catholics had drawn from the same verse in Isaiah in conceiving their high-risk protests of nuclear and other weapons in the 1980s and early 90s, named “Plowshares actions.” In the first such action in 1980, the “Plowshares Eight” damaged a nuclear warhead nose cone and poured blood on documents at a General Electric facility near Philadelphia. Plowshares protests, and their stiff prison sentences, occur to this day, taken up by successors to the Berrigan flock. A festival of vintage banners danced above the boisterous throng. (“Love Your Enemies – Jesus; Kill Your Enemies – Uncle Sam” was my son’s favorite). “We’re gonna walk with Dan Ber-ri-gan!” offered one celebrant to close the song. The peacemakers blessed themselves, as they filed in to bless brother Dan. The “sacrament of resistance” that Berrigan lived was the insistent theme of Kelly’s homily. Humor led the tribute. After thanking the medical staff that cared for Berrigan during his extended convalescence, Kelly welcomed the FBI detail that may as well have been in the church. “Dan Berrigan. Funeral. Resurrection. Now you can close your file!” In this levity was a coy message to the Jesuit establishment, whether present or watching the simulcast on a prominent Jesuit website. Berrigan’s true church could only be an outlaw church. The most theologically demanding portion of the homily was Kelly’s meditation on resurrection and how the ancient concept — which stands at the center of the Catholic funeral rite — was given new meaning by the Berrigans. 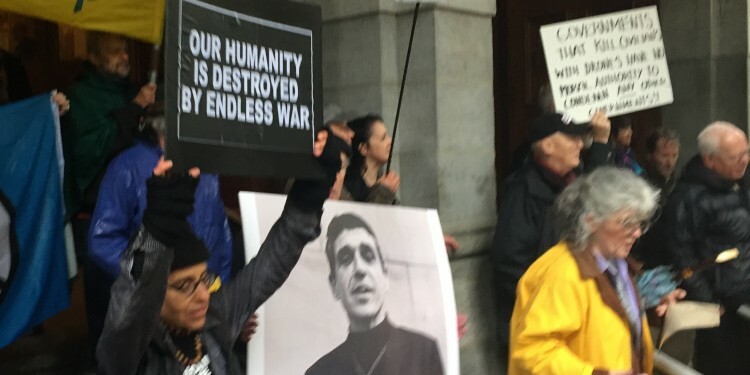 Herein Daniel Berrigan transcends his stature as an “activist priest” who breathed full-throated life into Christian values like love, peace, and mercy. Far more than that, he reinscribed the deepest meanings of the Gospel. The Berrigans by their acts against militarism and war rose up against death, but not of the inexorable kind. Their concern was murder by earthly conflict and the sorrows of persecution. In that sense, they ignored or even rejected the idea of theodicy. They were vastly more interested in the evil that men and women do to one another than whatever evil God may apparently permit. Humanity had made a mess of free will. Their mission was to turn the world toward peace, in defense of life itself. Human beings cannot raise the dead. But they can stop the killing. Thus, in works of resistance — not faith — the resurrection finds its truest home and Christianity its essential teaching. Still vital, faith seemed to Dan Berrigan the hope that in some times and places lives can actually be saved. On that hope he staked his life. Liz McAlister is herself a veteran of peace actions and a hero of the Catholic left. The wife of the late Phillip Berrigan, she was also among those closest to Dan. Her three splendid children, given Dan’s allegiance to his priestly vows, seem more than nieces and nephews and something closer to his own as well. McAlister had the task of asserting the absolute inseparability of the sacred and political for Berrigan in more worldly terms than Kelly’s cosmic homily. She referenced all that challenges the hope of the peacemakers, whatever their era. “It never seems to get better, and we walk in that reality.” Dan brought his militancy, she explained, into his numerous university appointments. “While other professors would rail against apathy and indifference, Dan would offer the insights of the consequence of being out in the streets,” arrests included. 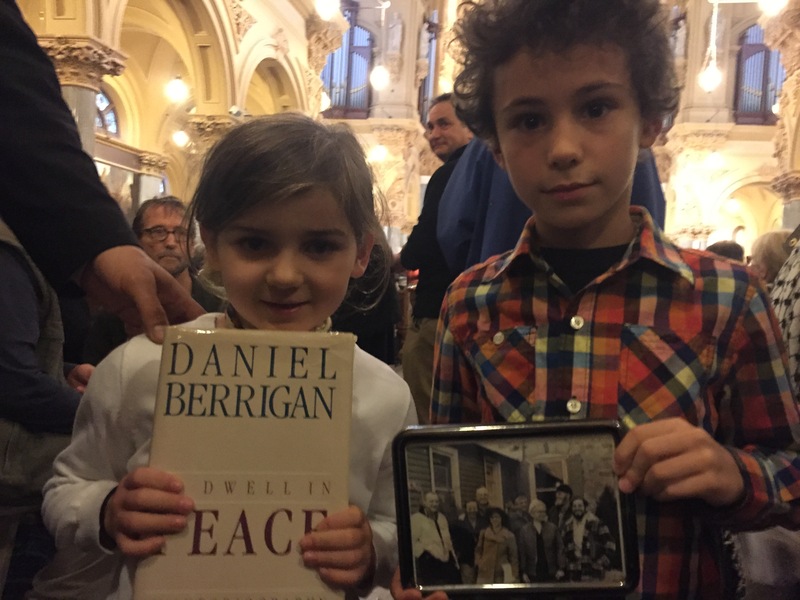 She implored, “There is no sense to hold Dan as an icon, especially in ways that exempt us from responsibility.” At this, the congregants rose in thunderous recognition of Berrigan’s life as an example, with implications for their own. With these words the church, two thousand strong, again rose — in honor and resistance — with wild applause. My dear friend Matt Daloisio, a leader in Witness Against Torture and great student of the Berrigan example, described the ovation as “one of the most profound moments in my entire life.” This epiphany bathed the vast hall. With both religious and political significance, McAlister definitively marked the Catonsville lines, famous to most in attendance, as the essential text of the Berrigan prophecy. Holy in their own right, they extend the wisdom of Isaiah, while pronouncing the sin of modern war. “The times are inexpressibly evil,” Berrigan continued in court in 1969. We all knew what he meant, for our own times also. “And yet,” he added (as Liz reminded us) “the times are inexhaustibly good / solaced by the courage and hope of many.” For an instant in the church, that hope felt vastly greater than all it protests. In Catholic mass, “gifts” are brought to the altar in preparation for the sacrament of communion. In a funeral mass, the life is remembered, its loss mourned, and its resurrection before the face of God celebrated. The traditional “gifts” are bread and wine, ritually transformed into the body and blood of Christ. 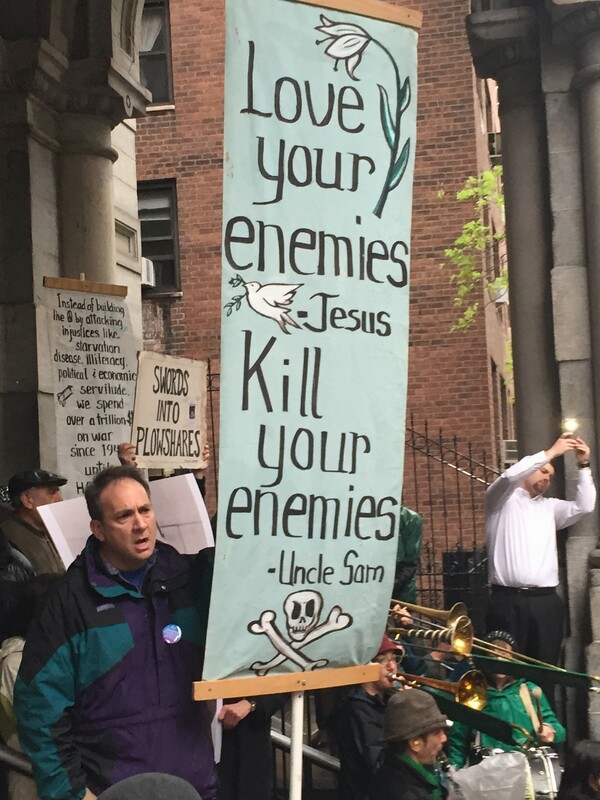 At this funeral, the gifts included also objects dear to Dan and his family: banners held at life-altering protests, books he had authored, a hammer used to beat on weapons. By request of the Berrigan family, children carried the gifts, as is sometimes done. My son Arlo, raised in no faith like his father, had the privilege of bringing one of these to the altar as I strode beside him. It was a mottled, black and white picture of the Plowshares Eight. With the gifts received, the Lord’s Prayer, tears, and hugs of peace followed. The union of vulnerability and defiance, frailty and resolve was fitting consummation to the ceremony. That union was Daniel Berrigan. It was Christ on the cross. It is all of us, in our own ways and traditions. Perhaps Dan Berrigan himself provided for the service the most poignant expression of that union, while suggesting, as always, an ethic of resistance. It seems unfair that the deceased should have to have the last word on his own death. But Berrigan appeared at times to exist in another dimension, with special powers of reflection. “Its almost like he lived right in the heart of God and reported back to us,” his nephew Jerry Berrigan had said. Future too tall. Another spring will tell. Tell another spring I will be there, and fairer. that striding giant I decree myself. Royally: though lowly afoot, striding unto death. What we love: there are not blades enough. Like others of his poems, this one is profound and quirky, part Beatitude and part Beatnik. In it there is a precious image of human beings: proud and a little vain, standing tall like tress, strutting like swans. There is also the inevitable succumbing of all of nature — humans included and no matter how regal — to the blade of mortality. Ashes to ashes, the eternity and naturalness of death. But there is also in the poem the implied horror at human slaughter. Whole forests disappear to the scythe of industrial avarice. With habitat perish the swans. Humans die on the blades of hunger, war, terror, torture, and drone strikes; in holocausts, on slave ships, and in genocides. This death is never acceptable. So much death, whether unavoidable or offensive, could easily overwhelm any faith in humanity, life, hope or even God. But here Berrigan provides the redemptive twist in declaring that the things we love — humanity, each other, trees and swans, plants and animals, peace and justice — are greater and more abundant than death, even as these may die. This possibility, this victory of life over death, lies also the heart of the resurrection. It was the guiding spirit of his godliness and acts of resistance. We entered the funeral knowing that Dan Berrigan’s life had changed the world and our own lives. We left hoping that his death would change these as well. Whether that happens is up to us. [*] The march was a fascinating tour through the dense ecology of progressive and radical institutions in lower Manhattan. St. Xavier Church is just two blocks from a prominent building of the New School for Social Research, where I am a professor. The New School, by history and reputation, is European, secular, Jewish, and Marxist. The Berrigan ceremony, by intriguing complement, was deeply American, churched, Catholic, and redemptive. Worth noting is that the church also sits on the same block as YIVO, the great Institute for Jewish Research exiled from Vilna to New York City with the Nazis’ advance. It is very much an archival monument to a near-vanquished Eastern European Jewish civilization, felled by persecution and war (and with Catholic complicity). [†] I thank Patrick Gilger, S.J. for clarifying for me aspects of Catholic ritual and belief. [‡] I credit Waging Nonviolence editor Nathan Schneider and fine essay “Claiming Dan Berrigan” with inspiration for this line. Schneider’s sentence reads, “I share many of [Dan Berrigan’s] convictions but very little of his courage.” America — The National Catholic Review, May 6, 2016. [§] The quotes from the service are based on notes I took while in attendance. My apologies for any small inaccuracies in my transcription. [**] I render the lines based on their published version in Daniel Berrigan, The Trial of The Catonsville Nine, Fordham University Press, 2004. McAlister quoted slightly different portions in her address.